“Therefore I tell you, do not worry about your life, what you will eat or drink, or about your body, what you will wear. Isn’t there more to life than food and more to the body than clothing? 26 Look at the birds in the sky: They do not sow, or reap, or gather into barns, yet your heavenly Father feeds them. Aren’t you more valuable than they are? 27 And which of you by worrying can add even one hour to his life? 31 So then, don’t worry saying, ‘What will we eat?’ or ‘What will we drink?’ or ‘What will we wear?’ 32 For the unconverted pursue these things, and your heavenly Father knows that you need them. 33 But above all pursue his kingdom and righteousness, and all these things will be given to you as well. 34 So then, do not worry about tomorrow, for tomorrow will worry about itself. Today has enough trouble of its own. O (Observation): Jesus is in the midst of his Sermon on the Mount. He is giving instruction to his followers. He is laying out a new ethic for living. As followers of Christ, we will focus on different things than those who do not believe. Part of this change is not to worry about our day-to-day sustenance, what we will wear, what we will eat. 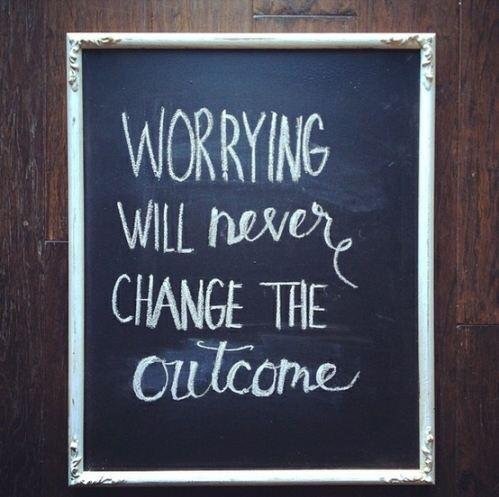 Those who do not believe worry. Those of faith don’t. A (Application): This is another one of those texts Jesus lifts up that stretches us. We have to worry a little, so we don’t starve…but then…Jesus has a point. Have you ever reached a point where you wondered how you would make it through the next day? How you would survive? How you would make your next payment on your home? Or electricity? This happens. And recently, our congregation had a chance to help a family pay for their electricity deposit for their rental home. We were able to help them out. They now have electricity and can heat their home in the winter time. Quite often, God chooses to work through those around us – through people we know and some we don’t. But God provides. And with this in mind, we need not worry. Our congregation has made it through some lean times, too. And yet we march forward trusting in the Lord, who continues to carry us forward. When has someone helped you out? When have you helped out someone else? When have times been so tough that you weren’t sure how to take a next step? P (Prayer): Lord, please continue to provide for us and through us. Help us to use the things we have been given for the sake of others. Amen. This entry was posted in Digging Daily and tagged Faith, Jesus, Worry. Bookmark the permalink.